Falvey Memorial Library :: Feedback Friday: Would you rather curl up with a Kindle, Sony e-reader, or a good book? Feedback Friday: Would you rather curl up with a Kindle, Sony e-reader, or a good book? There’s quite a buzz about the new technology that allows people to download (and read) books and newspaper subscriptions on an electronic device no bigger than a composition book. Some are embracing the electronic book with open arms. Some aren’t. Where do you stand on the use of e-readers? What about a bad book on a kindle? just kidding. I would pick a book over the Kindle or the E-Reader. The smell and feeling of a book wins out, even though they make a little spray of “book smell” for your kindle. Plus, imagine all the damage that staring at a screen more and more will do to our eyes. It is bad enough that we spend so much time on our computers. I don’t know if people would read more with a kindle or not. Would it create less jobs if it decreases book sales? What about the authors? I don’t like the Kindle or E-Reader. While I would certainly prefer curling up with a good paper book for my personal pleasure reading, a Kindle or other e-book reader would certinaly be a boon for my professional reading. I often find myself printing out reams of PDFs, documents, and excel files since they are so hard to read on a computer screen. I think e-book readers will become a crucial part of moving to a more earth-friendly office. That said: fiction is so much better in print! Ok, I agree with Robin. Textbooks on Kindle would be much easier than carrying 15 pounds of books that professors only use 10 pages of. I love books and would never give books up entirely. However, the Kindle and gadgets like it pique my interest quite a bit. The thought of being able to carry around a couple dozen excellent books without having to be a weight lifter is very appealing! Sadly, most e-book readers are encumbered by very restrictive licensing, DRM schemes and proprietary formats. The DRM and licensing in effect tell me that the e-book I purchased does not belong to me and I don’t have the right to read that e-book on anything but the device I bought it for. Imagine getting sued because you wanted to read your e-books on your laptop as well! The proprietary formats make it much more difficult for you to read your e-books on anything but your e-book reader, even if you were willing to go against the restrictive TOS you agreed to when you downloaded it? Where’s the fun in that? Just a couple good reasons books will be my main choice for the foreseeable future. Fortunately, it’s not a case of either/or when making the choice. I still prefer the print and am reading a series right now that I selected because of the art work on the cover. Not always a good reason to choose a book, but sometimes it’s reason enough. I’m not very experienced with the Kindle, but can we talk about print v.s online journals for a minute? There’s nothing better that turning the pages of Vogue, and seeing the colors jump right off the page. I was going to buy an issue of Vanity Fair at the grocery store but decided to read Falvey’s copy instead. I was disappointed to discover that the print has been canceled in favor of the online version. I think Kindle is great for one time use books. It definitely saves some paper making it environmentally sound. However, I’d much rather have a paper book for the books I love and want to reread. Harry Potter on a Kindle just wouldn’t be the same! Being an extremely avid reader, e-readers are an amazing triumph of technology. There is only so much a person can lug around, and I would much rather carry a single slim tablet than lug pounds upon pounds of dead wood everywhere I go. That being said, being a broke student, the kindle’s price is simply too large a pill to swallow. Worse than that, the wonderfully free (sort of) facilities of the library become useless to me. If the Kindle had loaner books like a library, I would buy it with no hesitation. The price of purchasing a book a week however, is a hard to deal with. Even at 5 dollars a book (on the cheap side), 250 dollars at the end of the year is significant for my work-study salary. With no resale value. a book I didn’t enjoy would feel like a complete waste. For textbooks, an ebook would be amazing. All too often I find myself lugging books halfway along campus to be 5 lb decorations on my desk. Any chance we can get the modern study bible on a Kindle DX? Please? I have owned several e-book readers, and I am just finishing a class in which I have used the Kindle 2 to read the Lord of the Kings by Tolkien. The Kindle 2 is a physically very well designed device. It is comfortable to hold and I find it much easier to read from it while lying in bed than from a 1500 page book. The search feature has been invaluable for use in class and in writing papers. I have found it very handy to be able to save bookmarks, highlighted text, and my own comments. I can also open up my notes on the Kindle and see a list of all of the bookmarks, highlights, and notes I made, and by clicking on them immediately see the text to which I was referring. The largest drawback I see for using the Kindle in a classroom environment is the lack of page numbers. It would not be practical for the Kindle to use standard page numbers since the text size on the Kindle can be adjusted to six different settings (I find this really useful to adjust for reading in varying light levels). Instead of page numbers, the Kindle uses a system of “locations” which are a bit like verse numbers in the Bible or other canonical poetry. The locations can easily be used for noting a place in the text, for example, I could tell someone to have a look at location 11,576, and she would be able to go directly to the indicated place in the text. The problem occurs when there is a mixture of Kindles and printed books in the classroom. It is then no longer possible for the teacher to say, “let’s start reading on page 476 about halfway down.” In my case, I would ask for a few words from the text and do a search on them; in that way I was able to get to the same location as the rest of the class. I also noticed that this was not a problem exclusive to the Kindle: some students had purchased books from sources other than the campus bookstore and there were editions that had slightly different page numbering. Sadly, those students were unable to have the book do a search for them and had to flip pages until they found the right spot. I would also like to respond to some concerns that were raised in other comments, in particular, those about eyestrain and comparing e-books with reading on computers and those about digital rights management. 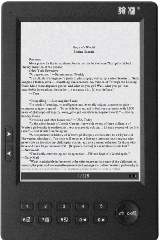 Eye strain is not an issue for e-readers that use e-ink, such as the Amazon Kindles and the Sony Reader. E-ink is a technology that is, like a printed book, completely dependent on reflected light; it does not use an internal light source like a computer screen and therefore avoids the primary source of eyestrain associated with reading on computers and similar devices. On the positive side, this means you can read in bright sunlight, but on the negative side, you can’t create in the dark or very dim light unless you have a clip-on light or flashlight. Digital rights management, or DRM, does place constraints on the use of electronic books, but they are neither draconian nor particularly different from the constraints associated with a printed book. You cannot make copies of e-books purchased from Amazon, however, Amazon is providing ways to read those books on more and more devices. At present, you can have up to three Kindles associated with your account and you can also read your books on an Apple iPhone. Moreover, you can put your own, or public domain content on the Kindle simply by e-mailing it to Amazon or by uploading from your PC directly to the Kindle. There is an enormous amount of public domain or free material that can be loaded onto a Kindle, including several versions of the Bible. In summary, I love my Kindle and would be hard put to have to part from it. I believe that it or devices like it will become more and more widespread in all walks of life and particularly in the academic world. The advantages to it are just too overwhelming: it is small, light, easy to carry, gives virtually instant access to all the books you could want or need, provides advanced features such as searching and annotating the text, and maintains an online backup of both the books and annotations. Advances will surely come, and once they are available with color screens and the problem with page numbers has been resolved, only Luddites will avoid using them in combination with printed books as a tool for edification and education. The library has purchased a Kindle and hopes to have it ready for lending to library patrons in the Fall. Look for the announcement!